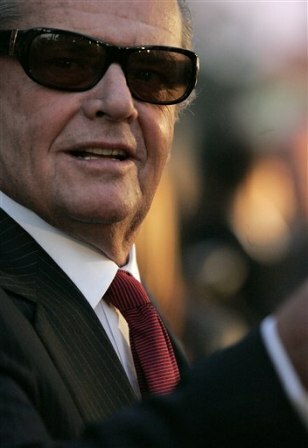 Actor Jack Nicholson opens up about his political stance in an interview with the Associated Press. He discusses solar power, his views on President Bush and more. “Enforce the monopoly laws of the Constitution they’re so proud of, which would have eliminated Enron and the interlocking directorate of conglomeration. Double teacher salaries. Find a way to liase from a personnel point of view between the military and the domestic police. Rob Reiner, the director of Nicholson’s latest movie, “The Bucket List,” and a staunch Democrat, said he’d had many private discussions of politics over the years with the actor. And yes, it was indeed traffic lights that got Nicholson started talking politics in his interview with AP to promote “The Bucket List,” out Dec. 25. At a top-floor Beverly Hilton hotel suite, he wore a comfortable dark Lacoste shirt and the mischievous grin that made him famous, poured himself coffee and munched on pieces of fruit. “How do they talk about these small increments of energy conservation when we burn 60 percent of the gas at stop signs and traffic lights?” he asked, eyes flashing. There is no momentum for solar electricity, he said, because of the powerful oil industry’s ability to set the scientific and political agenda.